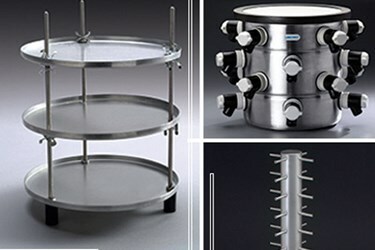 Determining the right accessories for your freeze dryer is essential for the freeze dry process. Samples can range from a few microliters in 96-well plates to large bulk type samples on trays. In order to determine the best accessories for your needs, you have to determine your sample size and the format you want to use. Freeze dry flasks vary in size from 25mls up to 2L. When using a flask, samples can go directly into the flask or test tubes can be placed in the flasks using optional test tubes holders. If the samples go directly into the flasks, they shouldn’t be filled more than 1/3 to ½ full of the flask's capacity. For maximum surface are, we recommend shell or slant freezing the samples. Two methods are available to shell freeze. A mechanical shell freezer uses rotating cold fingers in a heat transfer solution to give a uniform shell frozen sample. The manual method uses a dry ice solution and manual rotation of the flask until the sample is completely frozen.